Blue Origin, a highly secretive private rocket developer, was one of four companies chosen by NASA this week to receive funding toward the design and testing of a spacecraft to fly astronauts to and from low-Earth orbit. As part of the second round of NASA's Commercial Crew Development (CCDev) program, the agency will award $22 million to Blue Origin as it continues the development of its launch vehicle and critical systems. 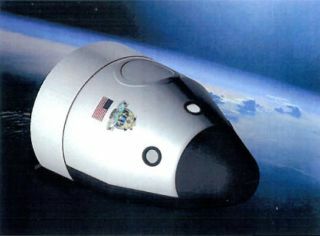 The agreement, which runs until May 2012, acknowledges that Blue Origin is developing a crew transportation system made up of a space vehicle "launched first on an Atlas V launch vehicle and then on Blue Origin's own Reusable Booster System." NASA plans to rely on private spacecraft to launch American astronauts into space after its 30-year space shuttle program shuts down later this year. The CCDev funding will be used to further the design of the spacecraft through a systems requirement review stage. This includes work on the spacecraft's thermal protection system and aerodynamic analyses of its cone shape. "It will also conduct separate commercial missions for science research, private adventure, and travel to other destinations" in low-Earth orbit. The three other companies who were awarded funds April 18 in the second round of NASA's CCDev program were Boeing, SpaceX and Sierra Nevada. Blue Origin was established by Amazon.com founder Jeff Bezos. According to its Space Act Agreement, the company is developing its spacecraft to be compatible with multiple rockets; the Atlas V was initially selected because it has a dependable launch record and can be adapted for human spaceflight capabilities. The company's work on its New Shepard suborbital vertical launch vehicle will also be used to develop key technologies for its orbital spacecraft. New Shepard is being designed as a fully reusable vehicle capable of flying three or more astronauts on suborbital flights for science research and space tourism purposes.